Yesterday, Foxtrot Alpha posted an in-depth report on what appears to be an all-hands search operation for a possible Russian submarine that penetrated Swedish waters and may have come under distress. Now that search is widening 44 miles south, into open sea and is intensifying, including a six mile quarantine around and over the enlarged search area. The source went on to say that the Dutch diesel-electric submarine Bruinvis was carrying out tasks near Stockholm last week and that it was probably the culprit of the sightings. Yet the fact that Russia knows these minute details may be telling, and the Swedish defense ministry has flatly denied the possibility that it is Dutch. 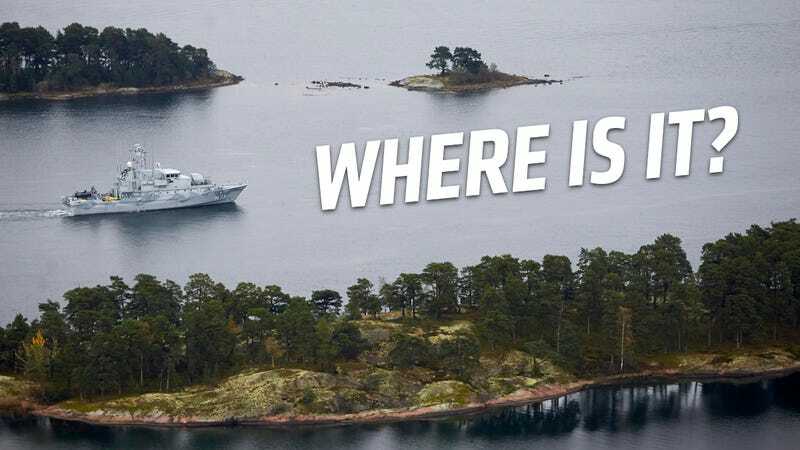 Other developments since yesterday include the Swedish armed forces releasing a photograph showing what is says is a 'foreign vessel' operating in the littorals off Stockholm, and went further into detail saying that three separate and highly credible accounts reported seeing a similar foreign craft. According to the eye witness who took the picture below, the craft surfaced and then dove back down moments later. Another report described a man in all black, with a backpack, emerging from the water and wading onto land. Swedish ground forces are said to have descended on the area where this report came from. Additionally, a picture posted by Swedish website DE of this mysterious man in black has also been released, but like the one of the supposed submarine, it is less than telling. The strange activities of the Liberian flagged tanker, the NS Concorde, that is operated by a major Russian state-owned shipping conglomerate whose CEO is a close confidant of Vladimir Putin (aren't they all! ), is still in the area. The ship had been zig-zagging as if it is looking for something last week and it mysteriously arrived on station on October 4th. Some think the vessel could have been used as a mothership for a Russian midget submarine. Meanwhile, a Russian research vessel, the Professor Logachev, was dispatched to the area from St. Petersburg and had three Swedish naval vessels in tow, it has since turned off its transponder. So what would a mini-sub, or a larger one for that matter, be doing in the littorals off of Stockholm? Planting or servicing surveillance equipment, tapping communications lines, mapping the region for future operations, practicing how to hide in "brown water" environments (remember Sweden is not a NATO country), or possibly even inserting special operators (although unlikely). Yet the real question here is what will Sweden do if it indeed finds a Russian sub in its midst? Considering how tense things have already been in the area, Sweden could perpetuate another Cold War by denying Russia access to their stricken boat. Then again, maybe none of it really matters, seeing as relations appear to be chilling based on Moscow's own accord and timetable, in which case all that can be done is for western nations to bolster their defenses and state the inevitable: "Winter is coming."